At Rowan’s STEAM Academy, students can experience the campus setting while earning college credits. As our children grow up and meet the challenges of high school, we want to prepare them in the best way possible for the next step in thei r educational journey: college. Freshman year of college is a big adjustment for students as they navigate their independence, a new environment, new people and a considerable amount of course work. One of the best ways to prepare for this is with hands-on experiences, perhaps even on a real college campus, with actual professors giving college-level instruction. And right here in South Jersey, we have o ne of the best programs for this: Rowan University’s STEAM Academy. 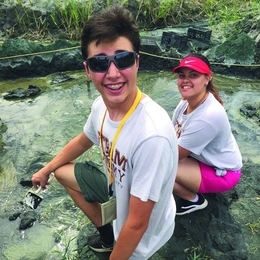 Founded in 2015, STEAM Academy —combining STEM concepts (science, t echnology, engineering and mathematics) with art, design, culture and humanities—offers middle and high school students the chance to earn college credits while getting a sneak peek at college life during their summer break. • Voyagers: a day program for late middle school a nd early high school students taking place from 8 a.m. to 3 p.m.
• Navigation: available to sophomores, juniors and seniors in a morni ng-only or full-day session or residential program with STEAM-focused field trips and immersive leadership training, personal development, SAT prep and building. • Pathways: a more rigorous residential program with a research internship in alignment with a student’s preferred STEAM focus. This is open to sophomores, juniors and seniors. Fischer says the tiered programs were built to allow students to try something new as they move into the next grade level. Freshmen can do the Voyagers level and then move on to Navigation and Pathways as t hey become upperclassmen. For those who are in the residential programs, they will experience suite-style dorms with their own bedroom nd shared sitting area, kitchenette and bathroom. Professional counselors from Rowan’s College of Education act as resident advisors. Field trips always include the Edelman Fossil Park in Mantua and Rowan’s Planetarium and Virtual Reality Lab. Students who are part of the residential programs may find themselves at the Franklin Institute, Longwood Gardens, the National Air and Space Museum in Washington, D.C., or even Hershey Park on weekends. When the three weeks are complete, students leave with a college transcript and three credits that can transfer any where, whether they end up back at Rowan, or somewhere else like Stockton, Princeton or Harvard. If they attend every summer during high school, they will have earned enough credits for an entire college semester. “This is shortening the time they need to spend at college, which will save them money, and gives t hem a head start on that level of education and the experience of being on campus,” Fischer say s.
The STEAM Academy session for 2018 runs from July 8-27. Applications are due by April 30, and the process mimics that of applying for college with basic autobiographical information, recommendations, a transcript and writing samples. Applications may be submitted by mail or email. And Fischer says it takes about one week to hear back on acceptance. This summer could be the perfect jump start into the college learning experience for your child. Visit Rowan.edu/STEAM for full details. Published (and copyrighted) in Suburban Family Magazine, Volume 8, Issue 12 (February 2018).